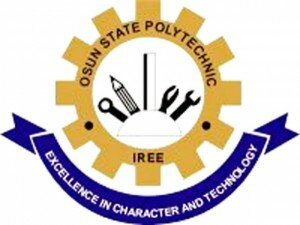 Osun State Polytechnic, Iree, OSPOLY daily Part-time, DPT programme admission application form for the 2017/2018 academic session is out. Applications are invited from suitably qualified candidates for admission into the Osun State Polytechnic, Iree Daily Part-Time (DPT) programme for the 2018/2019 academic session. Osun State Poly Iree DPT Programmes & Entry Requirements. (A) NATIONAL DIPLOMA PROGRAMMES IN THE FACULTY OF INFORMATION AND COMMUNICATION TECHNOLOGY. Minimum of 5 Credits in O’Level GCE, SSCE of WAEC, SSCE of NECO or NTC of NABTEB obtained at not more than two sittings from English Language, Mathematics, Physics and any other two subjects from the following: Chemistry, Agricultural Science/Biology, Economics/Commerce, ICT/Data/Computer Studies and Geography. Minimum of 5 Credits in O’Level GCE, SSCE of WAEC, SSCE of NECO or NTC of NABTEB obtained at not more than two sittings in English Language, Mathematics and any other three subjects from the following: History, English Literature, Yoruba Language (any other Nigeria Language), Government/Civic Education/History, Economics/Commerce/Marketing, Geography, Principles of Accounts/Book Keeping, Typewriting, Shorthand, CRK/IRK, French Language, Business Methods, Physics/Chemistry and Biology/Agricultural Science, ICT. Minimum of 5 Credits in O’Level GCE, SSCE of WAEC, SSCE of NECO or NTC of NABTEB obtained at not more than two sittings in English Language Mathematics and any other three subjects from the following: Economics/Commerce/Marketing, ICT/ Data Processing/Computer Studies, Office Practice, Typewriting, Shorthand, CRK/IRK, Yoruba Language, any other Nigeria Language, English Literature, French Language, History/Government, Principles of Accounts/Book-Keeping, Business Methods, Physics, Chemistry, Biology/Agricultural Science/Animal Husbandry. Minimum of 5 Credits in O’level GCE, SSCE of WAEC ,SSCE of NECO or NTC of NABTEB obtained at not more than two sittings in Mathematics, English Language, Chemistry and any other two subjects from the following:, Biology/Agricultural Science/Animal Husbandry, Food and Nutrition, Physics, ICT, Economics/Commerce, Further Mathematics, Statistics, Geography, Technical Drawing. Minimum of 5 Credits in O’Level GCE, SSCE of WAEC, SSCE of NECO or NTC of NABTEB obtained at not more than two sittings in Mathematics, English Language, one basic science subject (Physics, Chemistry, Biology) and any other two from the following: Further Mathematics, ICT, Economics, Geography, Government/Civic Education/History and Commerce. Minimum of 5 Credits in O’Level GCE, SSCE of WAEC ,SSCE of NECO or NTC of NABTEB obtained at not more than two sittings in Mathematics, English Language, two basic science subjects (Physics, Chemistry, Biology) and any other one from the following: Geography, ICT, Economics/Commerce, Biology/Agricultural Science, Food and Nutrition, Physics, Chemistry and Further Mathematics. Minimum of 5 Credits in O’Level GCE, SSCE of WAEC, SSCE of NECO or NTC of NABTEB obtained at not more than two sittings in Mathematics, English Language and any other three subjects from the following: Economics, ICT, Data Processing/Computer Studies, Commerce, Geography, History/Government/Civic Education, Book Keeping/Principles of Accounts, Business Methods, Agricultural Science/Biology, Typewriting and Shorthand. Minimum of 5 Credits in O’Level GCE, SSCE of WAEC ,SSCE of NECO or NTC of NABTEB obtained at not more than two sittings in English Language, Mathematics, Economics and any other two subjects from the following: Business methods, Book Keeping/Principles of Accounts, Geography, ICT, Commerce, Government/History, Literature in English, Biology/Agricultural Science/Chemistry/Physics, Typewriting and Shorthand. Minimum of 5 Credits in O’Level GCE, SSCE of WAEC ,SSCE of NECO or NTC of NABTEB obtained at not more than two sittings from Mathematics, English Language, Physics, Chemistry and any other one subject from the following: Biology/Agricultural Science, Further Mathematics, ICT/Computer studies/Data Processing, Geography, Economics/Commerce, Electronics, Technical/Building Drawing, Basic Electricity, Wood/ Metal Work, English Language and any other trade related subjects such as Introduction to Building Construction, Blocklaying/Bricklaying, Concreting, Carpentry and Joinery, Machine Woodwork, General Woodwork, Cable Joining, Civic Education/Government, Welding and Auto Macherdizing. Minimum of 5 Credits in O’Level GCE, SSCE of WAEC, SSCE of NECO or NTC of NABTEB obtained at not more than two sittings from Mathematics, English Language, Physics and any other two subjects from the following: Chemistry, Biology/Agricultural Science, Further Mathematics, Fine Art, Technical/Building Drawing, ICT, Geography, Economics, Commerce, Bricklaying/ Blocklaying, Concreting, Carpentry and Joinery, Machine Woodwork and General Woodwork. Minimum of 5 Credits in O’Level GCE, SSCE of WAEC, SSCE of NECO or NTC of NABTEB obtained at not more than two sittings from Mathematics, English Language, Physics, Chemistry and any other one subject from the following: Biology/Agricultural Science, Further Mathematics, ICT, Fine Art, Technical/Building Drawing, Geography, Economics, Commerce, Bricklaying/Block laying, Concreting, Carpentry and Joinery, Machine Woodwork, General Metal Work and any other trade related subjects such as Introduction to Building Construction, Bricklaying/Block laying, Concreting, Carpentry and Joinery, Machine Woodwork and General Metal work . Minimum of 5 Credits in O’Level GCE, SSCE of WAEC ,SSCE of NECO or NTC of NABTEB obtained at not more than two sittings from Mathematics, English language, a basic science (Physics/ Chemistry/Biology) and any other two subjects from the following: Principles of Account, Economics/Commerce, Chemistry, Biology/Agricultural Science, Further mathematics, ICT, Fine Arts/Technical/Building Drawing, Geography, General Metal/Woodwork and other trade related subjects such as Introduction to Building Construction, Bricklaying/ Blocklaying, Concreting, Carpentry and Joinery, Machine Woodwork and General Woodwork. Minimum of 5 Credits in O’Level GCE, SSCE of WAEC, SSCE of NECO or NTC of NABTEB obtained at not more than two sittings from Mathematics, English Language, Geography/Economics, Fine Arts/Technical Drawing and any other one subject from the following: Physics, Chemistry, Biology/Agricultural Science, Further Mathematics, ICT, Fine Arts, Technical/Building Drawing, Geography, Economics, Commerce, Statistics, Woodwork, General Metal Work, and any other trade related subjects such as Introduction to Building Construction, Bricklaying/ Blocklaying, Concreting, Carpentry and Joinery, Machine Woodwork and General Woodwork. Minimum of 5 Credits in O’Level GCE, SSCE of WAEC, SSCE of NECO or NTC of NABTEB obtained at not more than two sittings from English Language, Mathematic and any other three subjects from CRS/IRS, Chemistry, Physics, Biology/Agricultural Science, Fine Arts/Visual Arts/Technical Drawing, Geography, Literature in English, Yoruba, Economics/Commerce, Civic Education/ History/Government, Animal Husbandry, Fishery, Clothing and Textiles, Dyeing and Bleaching, General Metal Work, General Woodwork, Home Economics, Painting and Decoration, Craft Practice, Data Processing/Computer Studies/ICT and Photography. How to Apply for OSPOLY Iree DPT Admission. Applicant should purchase APPLICATION FORM at the sum of Ten Thousand Naira (N10,000.00) Only from OSPOLY Microfinance Bank Ltd: Iree, Ayetoro, Osogbo, Ilesa, and UBA Plc Iree. Completed application forms including photocopy of claimed credentials should be submitted not later than 31st January, 2019 to: THE DIRECTORATE OFFICER, Directorate of Part –Time Programmes, KOKO Village, Osun State Polytechnic, Iree.